Some thoughts about emails, spam and blacklists. Every year around Christmas the spammers show their creativity and they try to figure out how to bypass existing spam filters. Currently they try spam bursts. In week 51 the variation in spam mails increased rapidly. This led to a tripled amount of distinct hash sums of spam mails identified by the NiX Spam Project. The blue lines shows the number of distinct hash sums of spam mails. But this trend was already obsoleted by another trick used today. 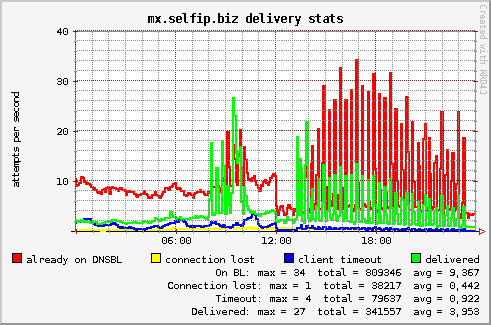 Half the day spammers tried to burst spams in very short time slots but with high volume from countless IPs. On the graphs below you can see that the bursts last only few minutes followed by quiet minutes. This behavior was repeated over more than ten hours. Attempts per second to deliver spam to spam traps. All dates are in CET (UTC+1). Got a server, few IPs, some domains and now getting Millions of Spam mails per day (not a joke!). This is intentional. Looking for more Spam. Please advice. Rustock is down. Spam volume decreases. And Yahoo! is filling the gap.